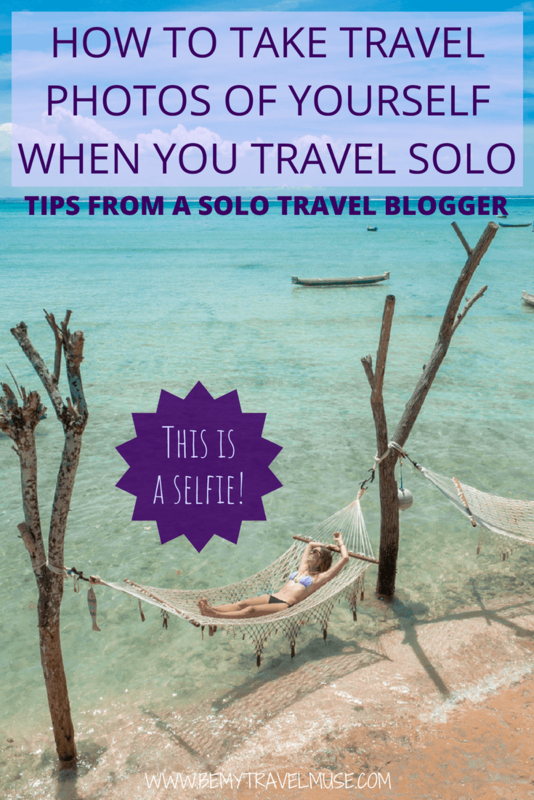 I travel alone most of the time, so that means that if I want to be in the photo, it’s going to have to be a selfie. It’s way more fun coming back from a trip with photos that look natural, unplanned and unposed, and like you had a photographer hiding in the bushes everywhere you went, though, am I right? A user-friendly camera with multiple settings and a WiFi function. I absolutely love my Sony A6000 and think it’s the best possible camera for this, especially since I can see how it looks on my phone screen before I take the shot. This is the most common method I use, particularly in nature where I know I don’t have to worry about anyone taking my camera. I just set it up exactly how I want it to look, hit the timer, and run into place. During the northern lights in Iceland, I put the camera on a tripod, used my phone as a remote, and stood very still for 30 seconds and watched the show. If you want to take the photo in the evening, you’ll definitely need a tripod and a long exposure, plus a timer release so that when the shutter releases to take the photo, it hasn’t been moved by your hand. If that doesn’t make much sense, check out my more detailed instructions on how to take photos in low-light situations. There will be times when you simply don’t want to lug your tripod along. For me that’s actually pretty often. I’ll often balance the camera on my backpack, a wall, a rock, or just about anything I can find. Just double check that it won’t fall before you balance it. In the example above, I found a little nook in the rocks and put it in there. Truth be told this shot took about 20 tries and certainly would have been easier with someone else around, but that’s the fun of the selfie! I placed my camera on the ground and put a water bottle under the lens to make it face upwards for this shot. I think the perspective made it look pretty cool! I wouldn’t have had the same kind of look if I’d had my tripod along. My wide-angle lens is my big secret. It’s how I get so much into the frame without having to run a mile away from the camera in order to look small in the photo. Yes, it is expensive, but it’s the lens I use almost every time, and I love it! I admit, it was really hard for me to get comfortable looking natural in front of the camera. I finally understood why so many girls on Instagram face away from the camera or just have photos of the back of their heads on their feeds – modeling ain’t easy! BUT I do also want my face to be in it from time to time. I can just picture 40 years from now when my grandkids ask me why just the back of my head is in photos. We don’t want that, right? My advice is to just keep taking them until you get one you like, even if it takes 20 tries. I’m not judging you, and who cares if anyone else is? I’m not a huge fan of selfie sticks normally, but there are cool ways that you can incorporate them that are way less typical, and can be pretty cool-looking in the end. This style is one of my favorites, and reminds me of a video game character. I did this one with my GoPro, which has a fish-eye lens perfect for getting big things all into one shot. How else are you going to get a hot air balloon and yourself into the frame? A common complaint while traveling is that when you ask someone else to take the photo, it often ends up wonky or they don’t put in the effort to make it look nice. To avoid this, I do all of the work for them first. While this isn’t your typical selfie, I still consider it one since you do everything required to get it looking exactly how you want it, but ask someone else to just push the button, or hold it in place exactly as you say. This is kind of like the previous suggestion, but in this case, take the exact photo of someone else that you want them to take of you, so that they can see exactly how you want it by looking at the photo on your camera’s screen before it’s their turn. In a new group of travel friends, someone is almost always bound to say yes, especially if you offer to send them digital copies later, and that goes double for if you take awesome photos (which you do, of course). What if you’re in a city or don’t trust that someone won’t run away with your stuff? If you’re not with a fellow traveler or haven’t spotted another tourist (preferably with a camera as well, that means she/he knows how to use one!) sling a lock around the bag and then lock it to something fixed. I like PacSafe products with wires that I can wrap around and through things for that. Note, this almost never happens. I can almost always find someone nearby who I can ask for a photo. With those tips in mind, I hope you’ll get in your photos more, will feel more artistic and enthusiastic about travel photography, and will be inspired to share what you create. 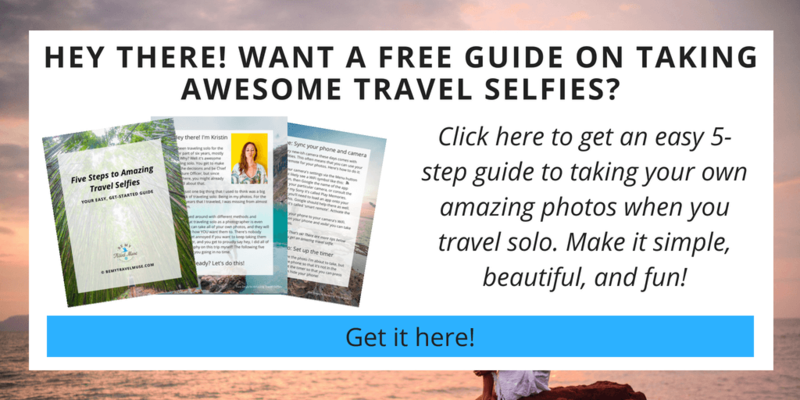 It’s tons of fun making photography a big focus of traveling, and when you travel solo, taking selfies is a big part of that. So go forth, and selfie away shamelessly! What a great post thanks! I have a ton of fab pics and I’m in none of them! I’ve just started getting more into photography and learning what my camera can do so intend to put some of these tips in action this weekend on my trip to Switzerland. I too have the whole self-conscious thing down to a tee but realistically does it matter? We’ll most likely ever see those people again anyway! Thanks again. Exactly! They’re strangers and you probably won’t ever see them again, so who cares? I usually settle for placing my camera on any convenient object and then, like you, running into place. Sometime it takes more than one try before I get a decent photo but it’s always worth the effort. Yeah I usually have to do 4+ times but it’s still my preferred method too! I wouldn’t leave it in a place where I feared that would happen. I would ask someone else to take the photo in a busy city, although I don’t take a lot of city shots you’ll probably notice. To get no other people in the photo, I usually go really early in the AM and/or wait for an opportunity.